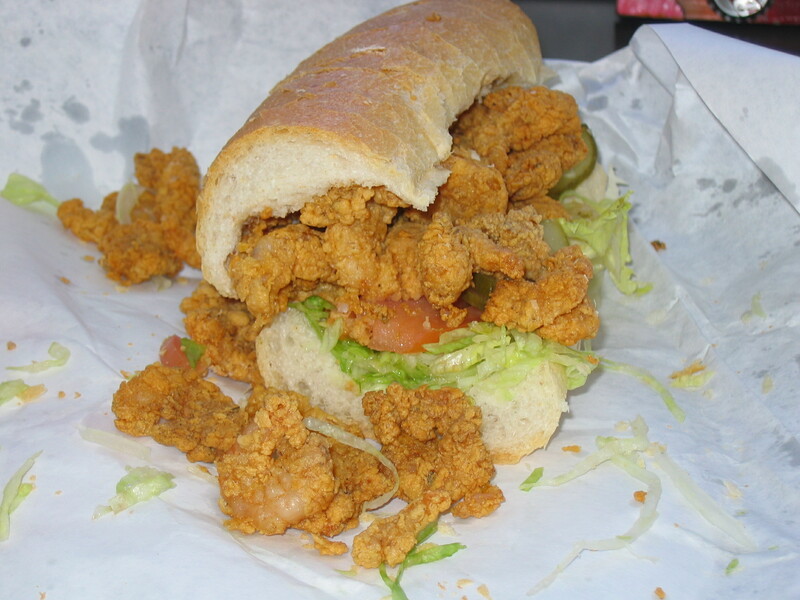 Shrimp Po-Boy. Eat gulf seafood while you are here! The annual meeting of the American Anthropological Association in New Orleans is less than 3 weeks away. The wise folks at the AAA asked me to put together a list of recommended restaurants, which they have now posted on their web site. Check it out and start thinking of all the great things you will eat. If you need reservations, it can’t hurt to make them soon. Eat local while you are here, avoid chains and you should be rewarded with some great meals. The restaurateurs in New Orleans say that people come here for the music and leave talking about dinner. They are right. I should add that there are now approximately 1,117 restaurants in the New Orleans area, according to veteran New Orleans food writer Tom Fitzmorris’ daily count (this is as of November 3, 2010). His count, by the way, does not include fast food chains or gas stations that serve convenience food, pharmacies, or anything other than what he calls “restaurants that matter.” He does include neighborhood sandwich shops and some grocery stores, because, in New Orleans, they matter. My list is, in any case, shorter and only includes restaurants that you can reasonably get to on foot, streetcar or cheap cab ride from the conference hotel. Also, I only included restaurants I know enough about to recommend. There are many others and they may be good too. There is one other thing that I think might be of use to those attending the conference: a bar guide. New Orleans is famous for drinking—some even claim that the cocktail was invented here (a claim that I have heard is demonstrably false, but they go on claiming it anyhow, probably because it seems reasonable when you are in a French Quarter bar). There are many wonderful bars in the vicinity of the conference hotel. You can get your drink to-go (in what we call a “go cup”) in most bars in the French Quarter, so feel free to stroll around with it (the Sheraton is next to, but not in the Quarter). Note, however, that if you get one of those big colorful drinks in a boot or other odd looking contraption, we will know you are from out of town. Rather than put together my own list of bars, here are links to two guides that I think are trustworthy, one from Gambit, a local weekly, the other from the Times-Picayune. We have wonderful local beers, great classic cocktails (the Sazerac, the Ramos Gin Fizz, which really were invented here) and a bunch of very creative bartenders making new drinks all the time. And you can walk to all of this…and stumble back, if necessary.